Our practice has made a commitment to mercury-free dentistry to preserve the health and wellness of our patients. Many studies have proven the inherent risks associated with mercury exposure. In order to protect our patients and staff from mercury hazards, we do not utilize amalgam fillings. In addition, Dr. Davoud and the team follow the strict protocols for safe removal of existing amalgam fillings, set forth by the International Academy of Oral Medicine and Toxicology. We have years of experience safely removing these fillings and replacing them with biocompatible alternatives. 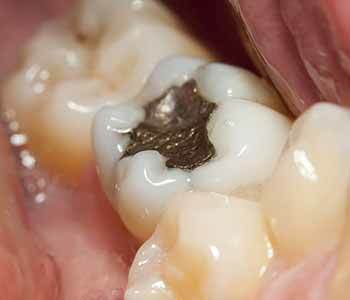 Not all dentists adhere to safe measures to remove amalgam fillings. Included in the protocol is proper ventilation, implementation of barriers, and physical care, which are all equally important. One of the most important steps to safely removing amalgam fillings is to take them out in large chunks, rather than grinding them out. This, along with advanced suction and proper ventilation, keeps risk of exposure to vapors extremely low. Exposed skin on both patients and staff is protected. Our staff takes special care to wear fresh rubber gloves, and patients have access to breathable air not contaminated with mercury vapors. As one can tell by the strict safety measures necessary, dental amalgam must be handled with extreme care, which is why have chosen not to utilize it in our practice. In addition, most patients are extremely pleased with the appearance of composite resin fillings. These biocompatible fillings are matched to the color of natural tooth enamel so they are not visible when patients smile or speak. Composite resin is an extremely durable material that adheres well to tooth structure. It expands and contracts with temperature changes, similar to the tooth, which minimizes risk of breaking or cracking. If you are in the Turlock area and would like to have a consultation on the removal of your existing dental amalgam fillings, call us today at (209) 666-8867.